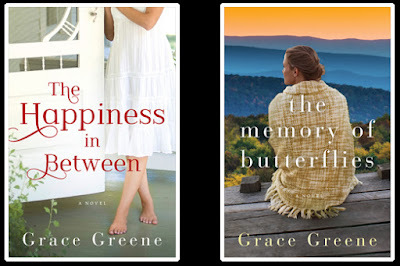 Sweet Romance Reads: I'm Grace Greene and I'm Delighted to Meet You! April is the month for re-introducing ourselves here at Sweet Romance Reads. It’s a great idea and especially appropriate for this time of year. Some of you may know that I write the Emerald Isle, NC books, BEACH RENTAL, BEACH WINDS, BEACH WALK and BEACH CHRISTMAS, and the Virginia Country Roads novels, CUBCREEK, LEAVING CUB CREEK, KINCAID’S HOPE and A STRANGER IN WYNNEDOWER. I was born and raised in Virginia but my mother is from North Carolina and I have many friends and family members there. You can find more info about the books I've written on my website www.gracegreene.com. I wrote on and off through the years, but never published. I painted, mostly in oils (I was an art major in college) and took a turn at quilting, spent many years crocheting blankets and doilies, raised children, stayed married, and so on. 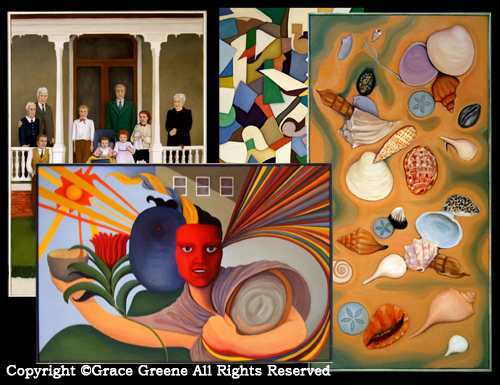 Here's a grouping of some of my paintings. In late 2010, I submitted two books I’d written to a small press, Turquoise Morning Press, and they offered a contract for those books and within a few months, in July 2011, I became officially published. It was a great experience and I learned a lot. I published my next books myself and discovered how much I enjoyed being Indie. I loved creating my own covers, even doing the formatting. The only issue was finding the time I needed to get it all done. A lot changed for me in 2016. A year ago this month I became a full-time writer. After decades of working day jobs and writing in the evenings and weekends, I took the leap.I was also very blessed because Lake Union Publishing (an Amazon Imprint specializing in Women's Fiction) contacted me about that time. I was thrilled. Ultimately, we agreed that I would write two books, both standalone single titles, for them. The first book I published with Lake Union was THE HAPPINESS IN BETWEEN, released January 31, 2017. The second book, THE MEMORY OF BUTTERFLIES, is currently available for pre-order and will be released on September 5, 2017. Can I tell you something about THE MEMORY OF BUTTERFLIES? I wrote that book starting with only the vaguest idea. Really, nothing more than a writing prompt, a "what-if". It gave me a starting point but I had no idea where it would go. I'm comfortable creating stories that way, but THE MEMORY OF BUTTERFLIES was different. It was a new experience for me. I felt as if Hannah Cooper was sitting beside me whispering the story to me. I merely recorded it. I to do a bit of revision and clean up, especially since I was crying my heart out through most of it, but the story itself is Hannah's. It was a very emotional experience for me. I will leave it to you, the future reader, to determine whether it moves you emotionally. I hope that when you are done ~ after the book is closed ~ it will linger with you and that Hannah will feel as real to you as she does to me. The book blurb is below. Pre-order link is here. A young mother's lies could end up destroying everything, and everyone, she loves. The Memory of Butterflies is a poignant story of family and forgiveness—of knowing when to let go and when to hold each other close. Hannah Cooper’s daughter is leaving for college soon. The change is bittersweet. A single mother since the age of eighteen, Hannah isn’t eager to confront the pain of being alone, but she’s determined not to let her own hang-ups keep Ellen from the future she deserves. As Ellen’s high school graduation approaches, Hannah decides it’s time to return to her roots in Cooper’s Hollow along Virginia’s beautiful and rustic Cub Creek. Your paintings are beautiful! And your newest preorder sounds wonderful. Wow! Best wishes for your continued success. Josie ~ Thank you. For many years, my life was focused on painting and other art work and I loved that time, but we are so blessed that we have options. Same with writing and publishing. Options. I like being free to try new things. Grace, congrats on your new and upcoming releases. Good Morning, Mary ~ Thanks for the congrats. There's nothing quite like new releases, is there? For me, I think it represents a project completed ~ completed and ready to share ~ not a project that never made it there. Margaret Daley posted your then new book, Beach Rental. It has become one of my most favorite books ever, so I had to read the sequels and then all your other releases. I love how you authors support each other as we readers become the winners. Looking forward to the Butterflies. Thank you so much! What a wonderful testimony as to the community of authors and readers. We all need each other's support and encouragement and we all benefit. Thanks again! 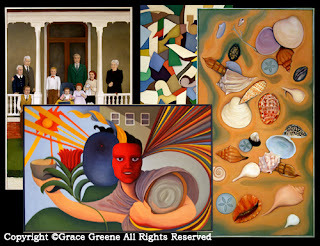 Grace, I also love your paintings. You have so much talent. Thanks, Merrillee. I am grateful to be living in an age when so many opportunities for work and self-expression are open to us. Writing, painting, photography... and so on.